The Belfast Giants are more than just an ice hockey team; they are also a symbol of the new mood in the city. This is one of the first non-sectarian sports teams in Belfast and it proud to represent the whole city and not just part of it. The Giants first burst on the scene in 2000 and they have done a lot to entertain fans since their arrival. They have also done much to further the popularity of ice-hockey in the city and now more people follow the sport than ever before. since that time they have become a team to be feared. The level of support for the Giants took everyone by surprise and this has to be one of the factors that led to their success. Having a whole city behind you is always going to ensure that players give that little bit extra. 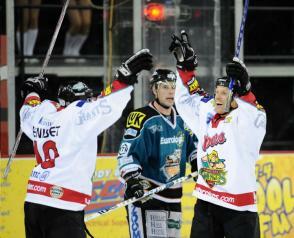 Since 2000 the Belfast Giants have managed to win the British Elite League twice; once in 2002, again in 2006. In 2010 they were the play off champions in this event. 2003 also saw them make it to the semi final in the Challenge Cup. The 2008 – 2009 season was the best ever for the club because they managed to capture the challenge cup but they also managed to win the British Knock-Out Cup. The way the team is currently playing means that fans can expect lots more competition wins in the future. There is no doubt that the Belfast Giants are a team full of pride and this is impacting their performance on the ice. The team includes local player Graeme Walton who grew up in Belfast but a lot of the players come from Canada and the United States. The city has adopted these foreign players as their own, and the team have expressed their love for Belfast and the local people. The fans of the team come from all parts of Belfast and sectarianism is never an issue. The Belfast ice hockey team the Giants are a great example of how sport can bring people together rather than divide them. When you see this team in action on their home territory you can see a whole city behind them. Ice hockey is a game where the violence is restricted to the ice and not among the supporters – this is as it should be. Supporters of the club have a lot to be proud of and the team always puts on a great show. Ice hockey is one of the most exciting games in the world to watch and it is no wonder that it has become so popular in such a short time period here in Belfast.